THIS SECTION shows a selection of flat woven rugs often called kilims. Sometimes they are just a plain weave with different colours and designs but they also frequently are embellished with designs in knotted pile and various forms of embroidery. 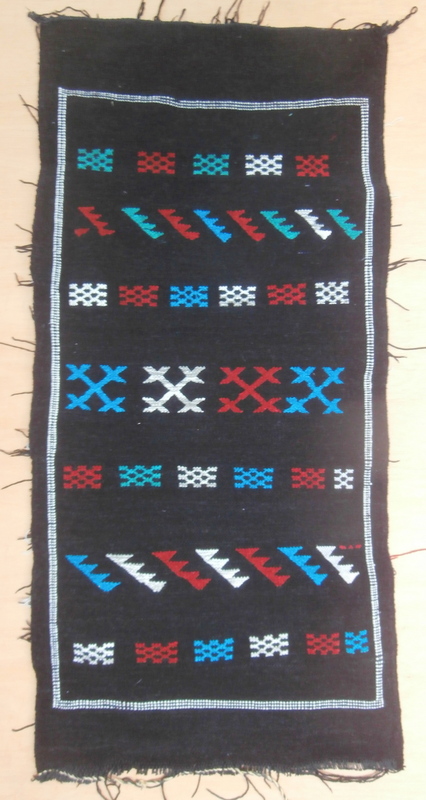 This group of weavings is for use in daily life and also for ceremony and special occasions. 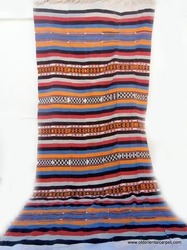 KILIM / FLAT WEAVE called "Kpoke" and woven by the Mende people in Sierra Leone in West Africa. The women of this group spin the fine cotton required for these kilims but the actual weaving is done by men. 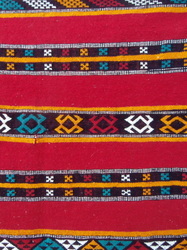 Width is achieved by joining together the long strips of cloth and depends on the use the piece is woven for. The colors are wonderful and bright. It will make a versatile throw, sofa or table cover or wall decoration. Reference 2741. Size 287 x 125 cms., or 9ft. 5ins. x 4ft. 2ins. Euros 125. Shipping depends on destination. VERY UNUSUAL WEAVING, thought to be a table or altar decoration from the Democratic Republic of Congo. 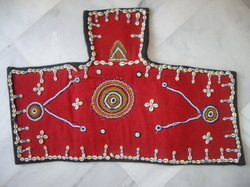 The materials used - cotton front, raffia back, cowrie shells and many beads are all found in weaving from this country. Fascinating table cover or wall mounting. Reference 2406. Size 59 x 88 cms., or 2ft. x 2ft. 11 ins. Euros 48 plus postage. 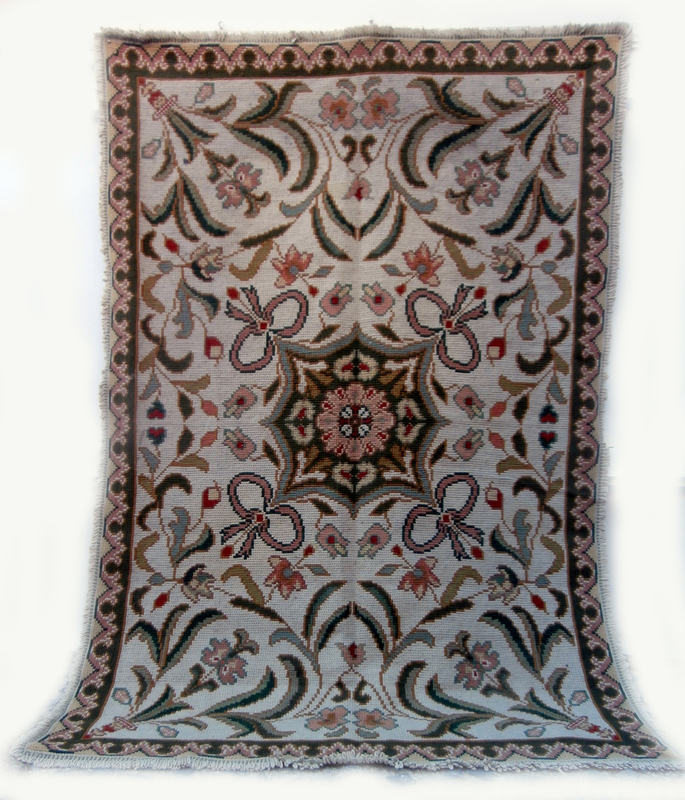 ARRAIOLOS NEEDLEWORK RUG rom the region of south eastern Portugal. The main centre for this centuries old hand stitched craft is in the the small town of Arraiolos itself but many were woven in the surrounding villages. The designs are traditionally floral, the colours soft and pastel and the materials local wools. This is an old piece but in perfect condition and its squarish shape is versatile enough to allow it to decorate several different areas. Reference 2980. Size 238 x 160 cms., or 7ft. 10ins. x 5ft. 4ins. Euros 280. 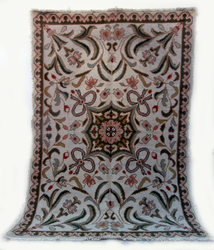 ARRAIOLOS NEEDLEWORK RUG rom the region of south eastern Portugal. The main centre for this centuries old hand stitched craft is in the the small town of Arraiolos itself but many were woven in the surrounding villages. 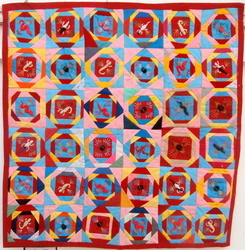 The designs are traditionally floral, the colours soft and pastel and the materials local wools. This is an old piece but in perfect condition and its squarish shape is versatile enough to allow it to decorate several different areas. Reference 2980. Size 238 x 160 cms., or 7ft. 10ins. x 5ft. 4ins. CLOSE UP. 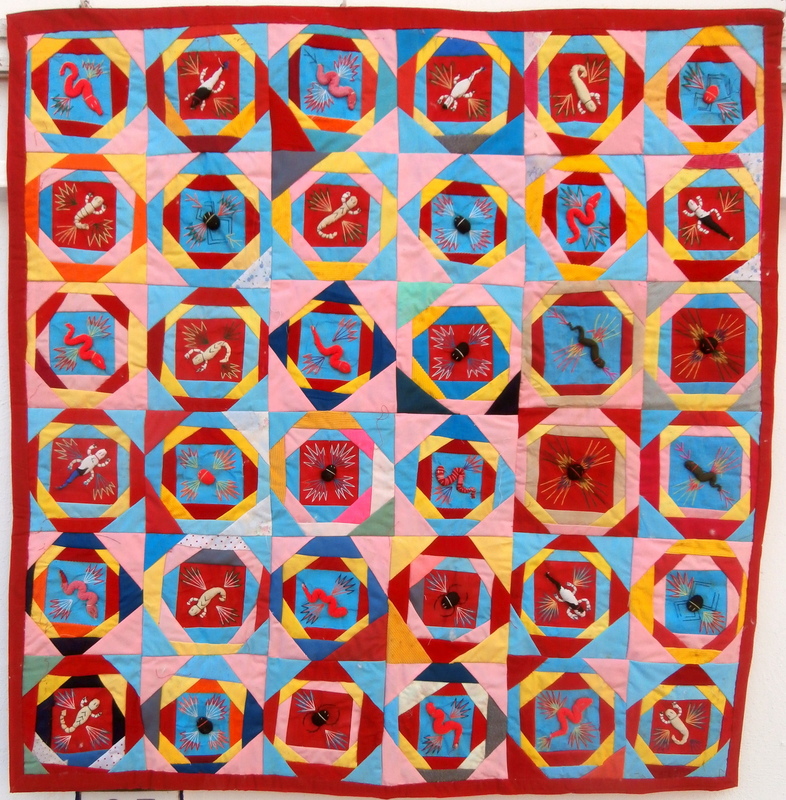 PATCHWORK PANELS which form a square and feature 36 individual panels each with designs of scorpions, lizards, beetles and serpants. 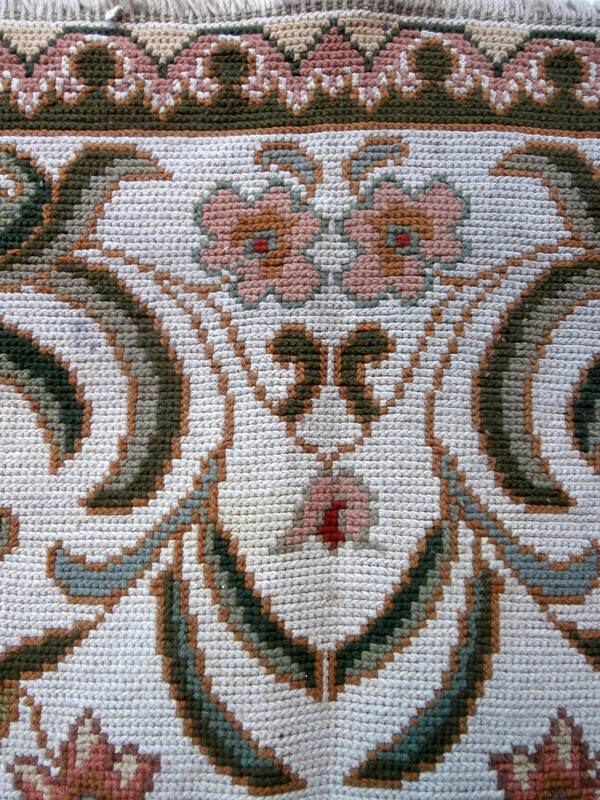 A most unusual and primitive decorative cloth for a wall or table. The origin is being researched but it is most likely to be from a rural area of one of the small Central American countries. Reference 2973. Size 99 x 101 cms., or 40 inches square. Euros 130. PATCHWORK PANELS which form a square and feature 36 individual panels each with designs of scorpions, lizards, beetles and serpants. A most unusual and primitive decorative cloth for a wall or table. The origin is being researched but it is most likely to be from a rural area of one of the small Central American countries. Reference 2973. Size 99 x 101 cms., or 40 inches square. CLOSE UP. 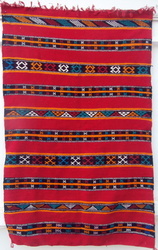 MOROCCAN BERBER KILIM which is a finely woven piece from the region of Zemoour in the western Middle Atlas. Many kilims from the villages in this area are brought to the carpet bazaar in Khemisset for the weekly rug day which is Tuesday. Qualities vary enormously and weaving of this degree of fineness is unusual. The many embroidered bands are complicated yet very well balanced. Ref. 2931. Size 150 x 100 cms., or 5 ft. x 3 ft. 4ins. Euros 135. 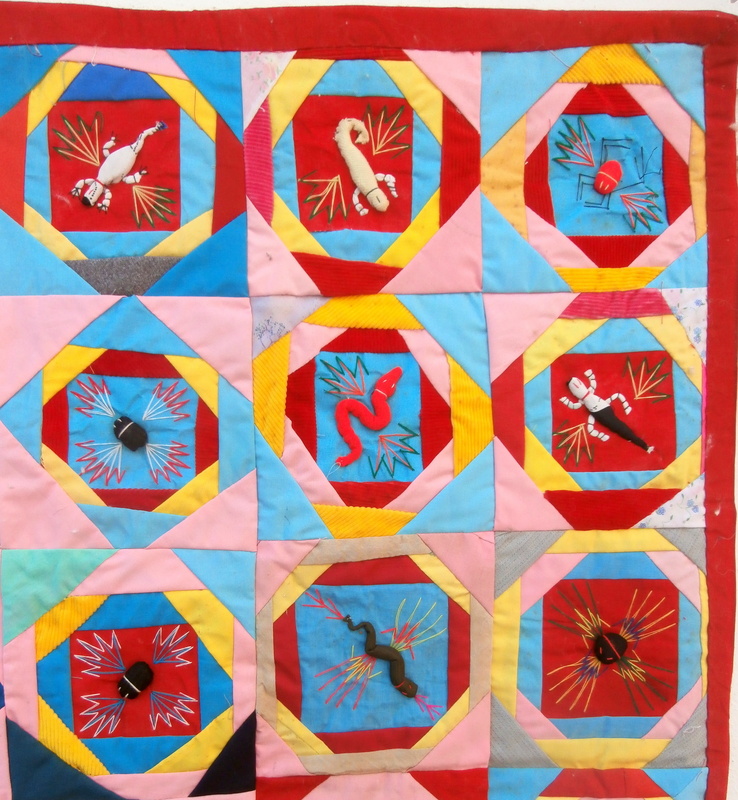 CLOSE UP of intricate well balanced embroidey designs.